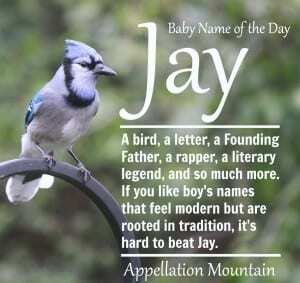 Jay is a letter, a bird, a rapper, a Founding Father. Thanks to Clio for suggesting our Baby Name of the Day. Bea or maybe Bee, often short for Beatrice/Beatrix. Dee, short for almost any name starting with the letter D, and typically used for women. Kay, traditionally short for Katherine, but also used with many K names, and bestowed independently. It ranked in the US Top 100 for girls from 1936 through 1945. Elle, like the letter L. Short for names that start with the El- sound, like Elizabeth and Eleanor. Boosted by Legally Blonde’s Elle Woods, and also bestowed independently. One more fun fact: it’s the French word for “she” and the title of a fashion magazine first published in France in 1945. Vee, short for nearly any name starting with the letter V, but rare as a given name. The name ranked in the US Top 100 for boys from 1956 through 1970, beating out Kay’s run for girls by a few years. It’s also worth noting that boys’ names starting with the sound, like James, Jason, and Jayden, have been Top Five choices in recent decades, which suggests that a great many men answer to this as a nickname, too, at least some of the time. Bird names for girls are stylish today. This might be the most popular avian name for a boy. As a surname, Jay almost certainly comes from the jaybird. It probably started out as a nickname for someone chatty. They’re a member of the crow family, cousins to magpies. Like the magpie, they’re known for flying off with shiny objects. Founding father John Jay served as an ambassador, governor of New York, and the first Chief Justice of the United States. Fast-forward to the twentieth century, and comedian-turned-talk show host Jay Leno is among the famous bearers of the name. In his case, it’s short for James. Jay Z is among the most successful rappers of all time, with 21 Grammy Awards and counting. He was born Shawn Corey Carter, taking his stage name comes from nickname Jazzy, and his mentor, Jaz-O. James Gatz is the main character in F. Scott Fitzgerald’s enduring 1925 novel The Great Gatsby. Born a poor farm boy, he reinvented himself as Jay Gatsby, the wealthy, generous host of extravagant parties. But it’s all a gambit to lure his beloved Daisy back into his life. In the 1970s, Robert Redford played the part. In 2013, Leonardo DiCaprio starred as the Jazz Age icon. In Sanskrit, jaya means victory. I’m not sure how common it is, but both Jay and Jai appear on lists of Indian names for boys. You might also recall that Tonto, faithful sidekick to the Lone Ranger, was played by Jay Silverheels. 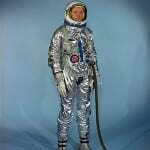 Silverheels was born Harold John Smith, a member of a Canadian Mohawk tribe. His stage name came from his middle initial, plus a nickname earned while playing lacrosse. It’s also the name of one of the Lego Ninjago: Masters of Spinjitsu animated ninjas, making it familiar to a young audience. 831 boys were given the name in 2014, down from over 5,000 annually during some years in the 1960s. But it’s up slightly from recent years. 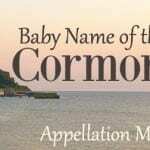 If you like your boys’ names short and simple, but prefer something slightly more traditional than Jax, Jett, or Cash, this could be the perfect compromise name for you. 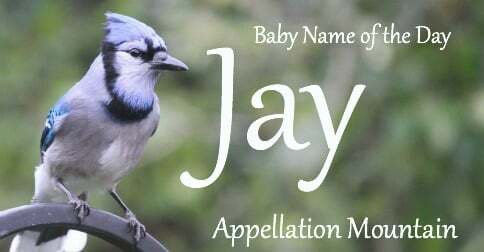 Would you consider Jay as a name for a boy? Yes, and Emily can be spelled (for fun purposes only) as MLE. I completely agree with you in that Jay feels quite modern, even though it has been around forever. I love it. I think it’s fresh and spunky, and I like the bird connection too. Oh, and I once met an Emmanuelle who went by Em, so I guess M could also be a letter that doubles as a first name, maybe? Good point! Em/M definitely counts – at least as much as V/Vee!